Hello ... Hello ... my old friends ... It's great to see you once again! Here is news of an exciting new release for fans of the predecessors of ELO - The Move. Although only just released as a MP3 download via amazon.co.uk this week on Monday 19th December, the whole of their legendary set at The Fillmore West, San Francisco in October 1969 appears to now be set for release in 2CD format on Monday 5th March 2012 according to amazon.co.uk - a full three weeks later than the originally stated date of Monday 13th February. "The Move were one of the 60’s most controversial and legendary groups and one of the most contradictory. A string of memorable hit singles, all written by pop genius Roy Wood, were set against a musically thrilling and often brutal live act, centred around lead singer Carl Wayne. The band achieved major recording success with UK and European hits including: "Blackberry Way"; "Fire Brigade"; "Curly"; "Night Of Fear"; "I Can Hear The Grass Grow" and "Flowers In The Rain" - the first ever record played on BBC Radio 1 ... 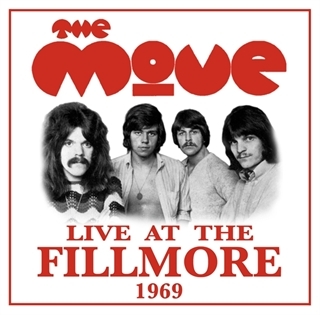 Thought lost for over 30 years, the master tapes from The Move’s shows at the Fillmore West were saved by Carl Wayne but suffered technical problems and could not be released. Thanks to advances in studio technology, Carl began restoring the tapes in 2003. Sadly Carl died in 2004 and was never able to complete the live album he believed would show how incredible The Move was as a live band. Now, with the full co-operation and permission of his wife - Sue Wayne - the tapes have been painstakingly restored, remastered and released in memory of The Move’s dynamic front man and lead singer."